This ten-minute one-act had a reading at NYU in the Spring of 2006. 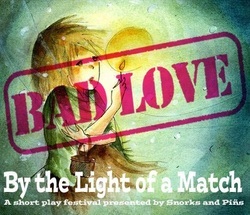 It was presented in a revised version as part of Snorks and Pins Productions' Bad Love play festival in February 2013. Avery approaches Charlie in a crowded mall, just as he was mustering up the nerve to approach her himself. With the help of his friendly TV Announcer, Charlie grapples to maintain control of the situation, and to get the girl. Charlie: I do. I know you. I know you’re funny and nice. You’re pretty. You’re forgiving when I’m just incredibly awkward. I know that we’ve been talking for three hours and you haven’t once looked at your phone. I know you think I’m cute because you blush if we make eye contact for too long. I know that you’ve probably been hurt in the past, by someone you thought you loved, and you’re afraid it’s going to happen again. I know that I’m not that guy. I know that you have the sweetest smile I’ve ever seen. Avery: I don’t know, Charlie. First workshopped in January 2010 by Hip Obscurity, the solo show Evidence has since been performed in various festivals throughout Manhattan, including playing at Theatre Row as part of United Solo, the largest solo festival in the world. When Thea's best friend Marco moves away, the bonds of their friendship stretch and warp. Facing post-college life and determined to have a brilliant career, Thea relies on Marco as a rock to keep her steady. But when his replies to her letters dwindle, Thea must come to terms with her own vulnerabilities and Marco's need for independence. "Look at it Marco. You see what’s on the other side of this postcard? You see how it’s an actual legit, released by a real company and not a vanity made by me, postcard? Well that’s MY damn photo on the back. A photo I TOOK that I got paid MONEY for and now ANYONE can buy it and show their friends they’ve been to the Windy City. So show your friends, as I’m sure you have many, where you came from. And write me back." "A leprechaun, a Greek Goddess, and a thirty-year-old teenager walk into an elevator." What sounds like the beginning of a joke becomes a claustrophobic crisis when the elevator lurches to a halt. From existential musings to career woes, passions run high, nerves are frayed and panic begins to take over ... in a very small space. "In the movie of my life, I would be played by Elijah Wood. I kept thinking that. If they made a movie based on us. Elijah Wood. Or, I dunno, Tom Cruise. God forbid they let me play myself. Assuming we survive, I should get to play myself, right? Assuming we survive." Bruce is dropped into the reception room to Hell ... a little bit early. As he finds himself transported back and forth between his final destination and his last day on Earth, Bruce valiantly attempts to cheat fate. "Listen, call back in a bit, I think a Judgment appointment slot for later today might be opening up. Yeah, I’m sure that is rare, but you know, mistakes happen. Accidental undeath, stuff like that."